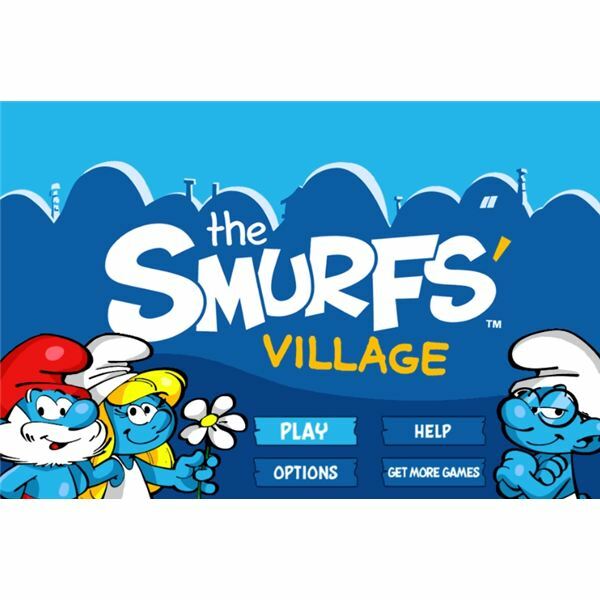 The Smurfs' Village iPhone game by Capcom Mobile is based on the popular 80s animated series The Smurfs. Similar to the original cartoon Brainy, Jokey, Lazy, Handy, Baker, Smurfette, Papa, and the rest of the little blue community are trying to avoid their arch nemesis Gargamel. When the location of their hideout is suddenly discovered by the evil wizard the smurfs must abandon their homes and relocate immediately. Guided by Papa Smurf players have to build a new town from scratch. The main objective of the game is to transform this small remote area into a village that the smurfs can call home. Users start out with one mushroom house and plot of plowed land. Earning coins, increasing population and leveling up are necessary in order to build the town. This can be done by gardening, completing quests, construction, and through playing various mini-games. 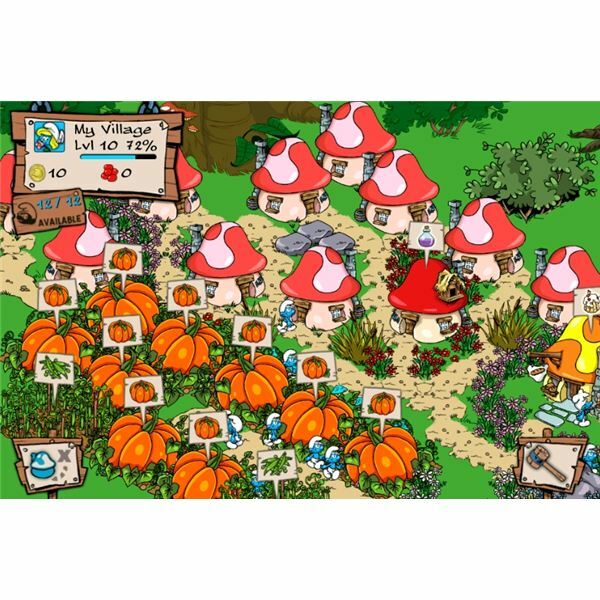 In this Smurfs' Village strategy guide you’ll learn all the basics along with some helpful tips and hints for establishing a flourishing village. Gardening or farming earns coins as well as valuable XP. Grow everything from raspberries to golden potatoes. As players level up higher earning crops become available. 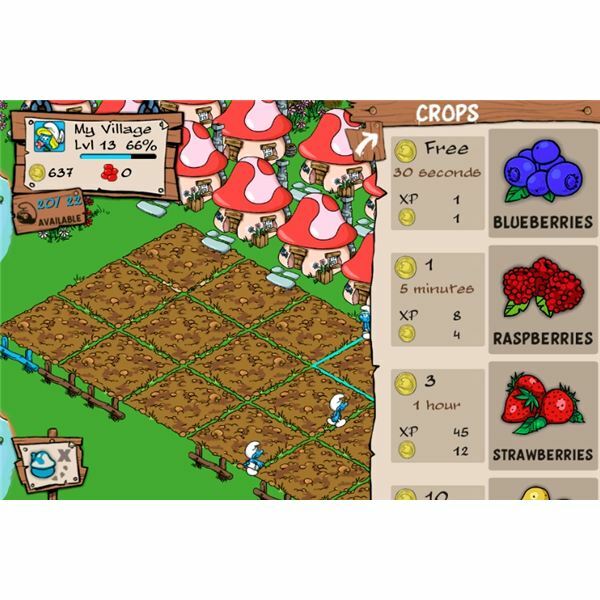 Each crop requires a certain amount of coins to plant and has a set harvest time. Beginners should focus on blueberries. They’re the only crop that is completely free to plant and can be harvested in 30 seconds flat. Although the rewards for this fruit are small the short time length enables users to accumulate coins relatively fast. This is crucial when first starting out. Gold coins allow players to properly build and decorate their village. Inexpensive raspberries and strawberries are also good choices. It’s important to select crops according to your playing schedule to prevent withering. There should always be crops growing in your village. A great Smurfs' Village strategy tip is to plant watermelons, tomatoes, or pumpkins before you retire for the day. Watermelons harvest in 12 hours providing extra income and experience the following morning. Tomatoes require 8 hours while pumpkins are ready in 18. Use blueberries for a boost when you’re low on gold. Below is a list of crops and their harvest rewards. Completing quests is the fastest method for leveling up. A question mark will appear over Papa Smurf’s head when a task needs to be done. These missions vary from planting a specific crop to sending smurfs out into the forest to spy on Gargamel. Players can earn large amounts of experience accomplishing these tasks. Only one quest can be done at a time. A quick strategy tip to use when tackling quests is to always have at least one smurf available. Some missions like the ones that involve smurfs venturing into the forest can take up to a day to finish if you don’t have extra smurfberries to accelerate the process. Each smurf needs a mushroom house to live in. There are different styles of homes to choose from. Beginners should always start with the basic red unit for 30 coins. Every house adds another smurf to your village. Players need to constantly build and upgrade structures in order to grow a massive community. Each mushroom house can be upgraded for a fee of 500 gold coins. After the initial upgrade of a home the fee switches to smurfberries. To keep your town growing build lots of homes and only upgrade each one once. 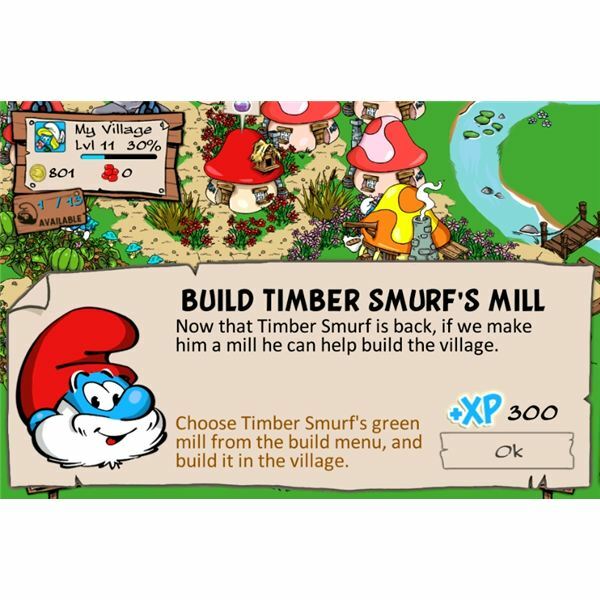 As players progress Papa Smurf will instruct them to build special structures for Timber, Handy, and Miner Smurf. These buildings will not only produce additional XP and coins but give users an opportunity to interact in mini-games. Place lots of rocks near the Miner Smurf's mine and logs by Timber Smurf’s mill for daily XP bonuses. Sprucing up the place also earns experience and is a great way to make your village stand out. Add different color flowers, pathways, benches, and bushes. Remember when decorating certain items like the well and laundry line provides gold daily. Pet snails or caterpillars boost XP and pretty butterflies will generate both several times a day. Clicking on smurf character buildings such as the bakery, lab, mine, or workshop will prompt a mini-game. Playing these games regularly will aid in leveling up. They usually generate experience, gold, or both. In the Greedy Smurf's Baking game cook delicious cookies, cupcakes, and mouth-watering cakes. Click on stoves to begin the baking process. When steam starts to rise from the treats quickly tap to take them out of the oven. The goal of the game is to bake as many pastries as possible without burning them. Papa Smurf's Potion Mixing game is all about technique. Players enter his lab to mix red, purple, or blue concoctions while being timed. There are two different control options. Shake or swipe the screen back and forth with your finger to mix the potions. Choose the technique that's easiest for you. In the miner's game players dig for silver, gold, or red and green gems in Miner Smurf's mine. The goal is to mine as many rocks as possible before time runs out. Players only have 60 seconds so it's important not to waste time. Some rocks contain nothing or worthless coal. As soon as you notice that it's either move on to the next rock of your choice. Practice and speed are the only requirements to master this game. The secret in Handy’s Workshop game is to wait until the meter is full for more powerful strikes. Gardening, questing, building, and playing these mini-games consistently is the key to leveling up quickly. 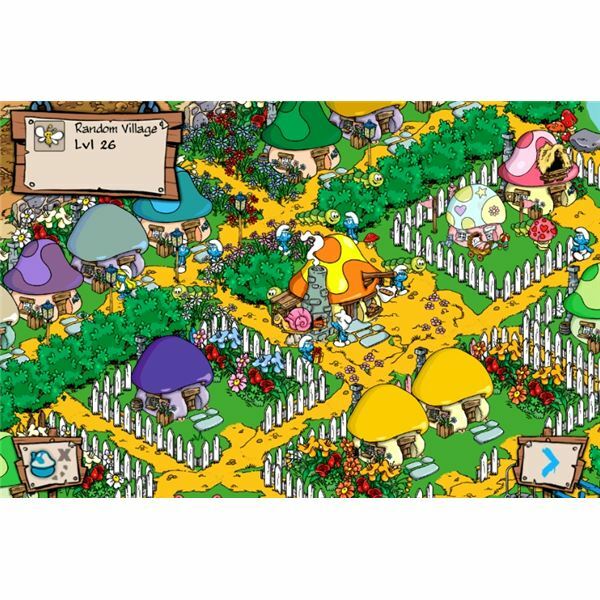 Use the tips in this Smurfs' Village guide to build the ultimate smurf paradise.